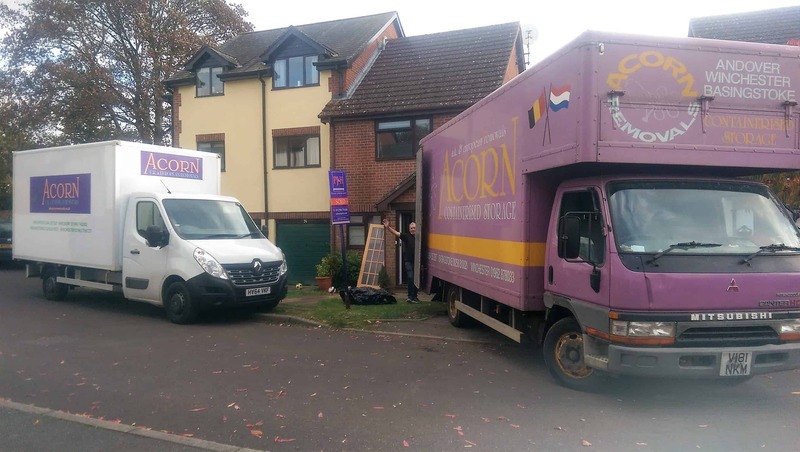 Acorn Removals have been helping people move home from Andover, Amesbury, Basingstoke, Newbury, Winchester and surrounding areas throughout the UK and Europe for over 35 years. We offer a tailor-made service that meets the individual needs of every customer, designed to make a stressful time that little bit easier. Our staff have a wealth of knowledge that enables us to provide a reliable and professional service, one that you can put your trust in. From your first contact to driving away from your new property Acorn Removals puts their customers first. Everything at Acorn is tuned towards providing a reliable and professional service you can put your complete trust in; by providing a range of services you need only ever deal with one company, and we guarantee you really will only deal with us; no load transfers to other suppliers or foreign “partners”; door to door, country to country you deal with just one van and one team of removals operatives. You can find full details of our services on the removals, packing and storage pages of this website and we welcome enquiries at any time; contact us today to discuss your requirements and arrange for a quotation. I am sending you this email to say thank you to all of you for the fantastic way you handled our move. We were extremely satisfied with every aspect of the move. From the moment you arrived, you instilled confidence and peace of mind. We were so impressed with the ease and care you all took with our prized possessions. We will definitely recommend you to anyone that we know who may need your services in the future. Thank you all once again. Thank you very much indeed for doing such an excellent removals job for me from Winchester to my home. You and Bo did the job with great care, efficiently and calmly always taking great care with all the items. Thank you very much for taking such special care with the grandfather clock. I am very pleased to report that the pendulum has not stopped since you set it going and the clock is keeping excellent time! Many thanks. David and I wanted to write at the earliest opportunity to thank you for moving us out of one home and into another. I have moved house eight times so far and it has never been so easy. Since you saved us to much trouble, we’d like to take some trouble now to sincerely thank you and recommend you to anyone wanting a stress free move. We would just like to thank you and Bo for all the hard work you put into making out move from Basingstoke to Dartmouth an altogether painless experience. I would thoroughly recommend your services to anyone who is contemplating a move in the near future. Thanks again. Every member of the team were professional, polite and courteous. Nothing was too much trouble and they went the extra mile and more in every aspect of our house move. I would highly recommend this company. Very good service, everyone involved was courteous and helpful and made a stressful move from Oakley to Torquay a smooth and easy process! Would not hesitate to recommend acorn removals! Very competitive price also thanks guys! These people are masters at removals. A family business of a cheerful and friendly removal team. Nothing was too much bother and they took care of our belongings perfectly. It took them a long time to assemble our v intricate furniture, they did it without complaining. This is the second time we have used John and Sally to pack us up and move us. Sally is a fantastic packer. Every box was labelled so it arrived in the right room at the other end. This made unpacking very easy. John and his team worked non-stop to get us into our new home as quick as possible. I highly recommend them especially if you want a personal and friendly service. I cannot recommend Acorn highly enough. They are a brilliant, friendly company. We had used them before but were going to use another company this time as they were a little bit cheaper. The other company let us down big time and we lost our deposit. Acorn very kindly stepped in at the last minute and helped us out and therefore made what would have a been a very stressful move into one of almost pleasure. Thank you to Sal, John and the guys for all of your help. Would always recommend you to anyone wanting to move home.